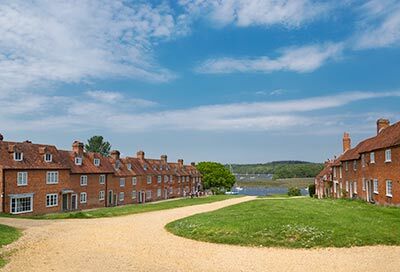 Enjoy a stroll beside the Beaulieu River, from picturesque Beaulieu village to the historic ship building hamlet of Buckler's Hard, passing along the way through parts of the North Solent National Nature Reserve. This pleasant 7.5 kilometre (4½ mile) walk starts close to the main street in Beaulieu village and follows the course of the Solent Way - a long distance, largely coastal footpath running from Milford on Sea to Emsworth Harbour - to Buckler's Hard. The route passes Beaulieu Mill, an ancient now disused tide mill, and the large tidal mill-pool - the Mill Dam - created by the monks of Beaulieu Abbey to provide a head of water to power their original mill. Within sight of Beaulieu Abbey's impressive 14th century Outer Gatehouse, the route leaves the village and goes south-east through meadows and ancient woodlands beside the river and its adjacent salt-marshes. Bailey's Hard is passed along the way, site of the Beaulieu Estate's old brickworks and a historic ship-building centre in its own right. Look out, too, for the charming thatched cottage built in 1760 as the 'Duke's Bath House'. And finally, historic 18th century Buckler's Hard is reached, where ships for Nelson's navy were built and 18th and 19th century cottages line a wide central street. Here visitors can learn about the past in the Maritime Museum and Shipwright's Cottage, enjoy refreshments and, in season, take a cruise on the Beaulieu River. Or, of course, simply soak up the atmosphere of this delightful place before heading back to Beaulieu. Find out more about Beaulieu village and check out the history and heritage of Beaulieu and Buckler's Hard. Level ground with gravel or similar hard-packed surfaces, apart from during an optional riverside detour which can be a little wet and muddy underfoot. Tea rooms in Beaulieu and Buckler's Hard; Montagu Arms in Beaulieu and the Master Builder's - Yachtsman's Bar at Buckler's Hard. Park in the 'Pay and Display' Beaulieu village centre car park and walk or cycle to Buckler's Hard where pedestrian / cyclist access to the historic village and waterfront is free of charge; or alternatively, start the route at Buckler's Hard where the entrance charge includes all day parking and also provides access to the Maritime Museum and Buckler's Hard Story, and the Shipwright's Cottage. 1. Leave the Beaulieu village centre car park by the entrance leading to the High Street (when looking towards the Mill Dam, this is the entrance to the right). Reach the High Street and turn left, and then at the first 'T' junction, go right, beside the quite busy main road. (Notice the red-brick cottages and other buildings that were probably built with materials fired in the now defunct brickworks passed a little farther along the walk route - those owned by the Beaulieu Estate carry a small plaque bearing three upturned diamonds). Pass in front of the Montagu Arms, take the first turn on the right, beside the hotel and continue along Fire Station Lane. (A little beyond this turn, on the right, is Beaulieu Mill, which has its own roadside interpretation board; whilst across the road, the mill race - the water channel used to power the mill wheels - can be seen beside the cottage of the same name. Sluice gates used to control water levels in the Mill Dam are farther on, and beyond them is the 14th century Beaulieu Abbey, Outer Gatehouse). Follow the tarmac road as, a little after the fire station, it bears round to the right and almost immediately becomes a fairly wide gravel track (wide enough for vehicle use). 2. Continue straight ahead, pass through a pedestrian gate and go along the main but somewhat narrower gravel track running parallel with the estuary of the Beaulieu River away to the left. Pass on the left a Natural England 'Glades and Grasslands' interpretation panel beside an area of unimproved grassland; and a little beyond, also on the left, a narrow, reed-lined side-stream leading to the main river. Continue into an area of woodland and cross a side stream at a narrow bridge. Pass another interpretation panel, this one providing details of the local ancient woodlands, leave the woodland and continue beside a mature hedgerow on the left and a damp field on the right. 3. Reach Brickyard Cottage on the left, follow the track as it bears left and immediately right, past the cottage and the adjacent site of the old brickworks - now a private residence but still boasting an old brickworks-related chimney. (An interpretation board is nearby, detailing the history of Bailey's Hard and brick making on the Beaulieu Estate, whilst the grounds of Liquid Logistics / New Forest Activities are on the right here). Continue along the gravel track for a short distance, past on the left a private track used by Beaulieu River Mooring Holders, and after a further short distance, past another turn on the left signed 'Private Residents only'. Follow the main track as it immediately bears right and then almost immediately turn left, following the 'Footpath to Buckler's Hard' sign. 4. Continue on through what is now mature woodland and after around 500 metres, leave the main track by turning left to follow beside the Beaulieu River along what is aptly described as a 'Riverside Walk' - this offers glorious views and informative interpretation boards that explain much about mudflat and river habitat ecology. The route along here is very obvious and can hardly be missed, so instructions are unnecessary, although part-way round, the main track can be rejoined or a left fork at a 'Y' junction taken to cross a railed bridge over a stream and continue alongside the river to eventually pass a gravel track on the left - 'Private Mooring Holders Only' on the gate - and immediately after reach the main track a little closer to Buckler's Hard. 5. After going left along the main track, immediately pass a left turn where a short detour is available along a boardwalk leading to Keeping Marsh bird-watching hide which overlooks an extensive reed-bed and an area of open water. After the potential detour, carry on along the main track, leave the woodland and when around 200 metres beyond Keeping Marsh, pass a boatyard on the left and continue straight ahead. 6. After a further short distance, reach a road leading to the Bucklers Hard Yacht Harbour on the left, go straight across the road and follow the signed track to Buckler's Hard Maritime Museum and Master Builders Hotel. (Cyclists should turn right here to follow the road to Bucklers Hard village). Pass a thatched cottage on the right with accompanying interpretation board and continue on to the village. 7. Retrace the route to return to Beaulieu - take the Riverside Walk section of the route on the way back or simply remain on the main track - and when close to Beaulieu village (quite soon after passing through the last gate, opposite the first of the houses on the right, on the edge of the village) follow a sign on the left stating 'Footpath to Beaulieu Village'. Eventually emerge onto the High Street opposite the track leading to the main car park.